I just picked this up on a whim – from the blurbs and sample it sounded like it would be good escapist fare. It’s more than that because of the structure and writing, Faulknerian, McCarthian, strong, Biblical, but definitely Henderson’s own. Once again, as is typical with contemporary novels, we have two interwoven plot threads. Both take place in 1981 and involve the same protagonist, Pete Snow, a rural Montana social worker with some difficult problems of his own. Pete goes to Texas, is unable to locate Rachel and returns to Montana where he tries to do his day job while he continues to seek his daughter. Bringing food and supplies, he goes to visit the Pearls at their camp in the wilderness and this introduces the second plot thread. 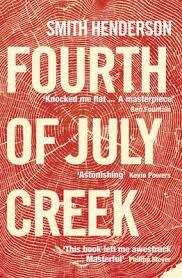 Jeremiah Pearl lives reclusively with his relatively large family in a house on the banks of Fourth of July Creek. Pearl and his wife are very religious and paranoid and often accompanied by Ben, one of his sons, who becomes attached to Pete. The scenes change without warning. Rachel is the focus for some time – Pete is beside himself. A social worker steps in and relates a huge chunk of Rachel’s story. The suspense builds around the paranoia and strangeness of the Pearls, they’re quite unpredictable, as well as law enforcement which gets involved at several points in the story. Everyone has guns, there’s a lot of booze, emotions are high, and Henderson writes very, very well.